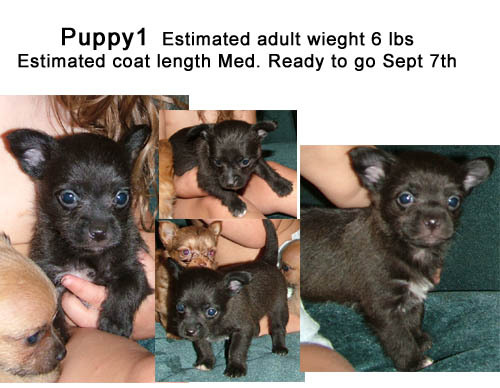 Puppies were born July 24, 2009. This is our best litter yet. 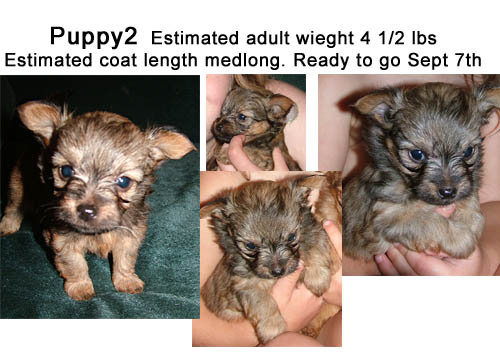 These puppies are estimated to weigh 6lbs and under as adults. As always two have been presold leaving us with the three wonderful male chorkies listed here. Chorkies are what people like to call a designer dog, combining the best qualities of the yorkshire terrier and the chihuahua. While many may be discouraged by this thought and critical. We encourage those that are to consider how, many of the AKC breeds that we know today were established in the first place and recommend reading our intro page Our Dogs as well as The Modern Kennel Conundrum by Jon Mooalem from the New York times. We have coordinated with other chorkie breeders that are trying to establish specific qualities in this breeding and do not inbreed our dogs. In such there is a growing breed standard. Though the AKC will accept some breeds over time into thier stock service registry this registry has limits to what you can do in the show ring and given the politics and high level of discontent by AKC breeders of dogs that were not developed during thier initial inbreeding process in the 1800's we certainly are not disillusioned about thier acceptance. Many of them seem to have forgotten how thier breed of interest was established in the first place and frown heavily on those of us that are working hard to do the same thing thier predicessors did in establishing a breed by breeding for specific traits and qualities. Whether it for an apartment sized mastiff (mini mastiff) or a gaurdian live stock dog such as the pyredane or pyremastiff. We are not saying that every AKC recognized breed has started this way only that many have. And we are certainly not discouraging anyone from buying an AKC registered dog. We have several ourselves obviously, and we still have many many friends in the AKC community. We are however hoping to equip those that do decide to go with a designer dog breed with the knowledge and information they may need when they find themselves being criticized for thier choice. We also recommend that you do your research on the dog of your choice and the breeder. 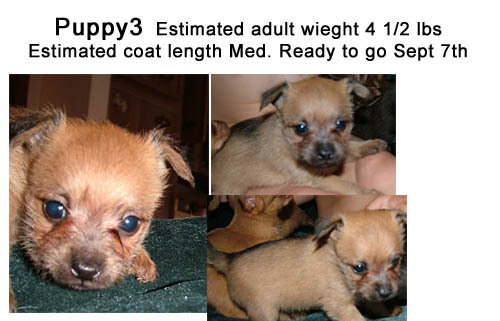 What traits are they breeding for what do the parents look like, how many litters do they have a year from the same dog. This should be no more than one. We recommend 1 every other year but it's not uncommon even for those that show AKC to breed every year. We just discourage the idea of puppy mills. Unfortunately even AKC breeders can fall into this catergory. It's just a matter of perspective. There are many AKC breeders that breed far more often than the designer dog breeder yet because of the politics and social class the designer dog breeder will be the one labled as a puppymill. The bottom line is if you like the dog and are comfortable with the price don't be discouraged by those that think you have to have the so called AKC registered pup. If you are happy with what you see that's what is most important. You can buy what you like or you can buy what someone else says YOU SHOULD LIKE.